Now for the serious part – a Dvar Torah, from the Modzitzer Rebbe Shlita. 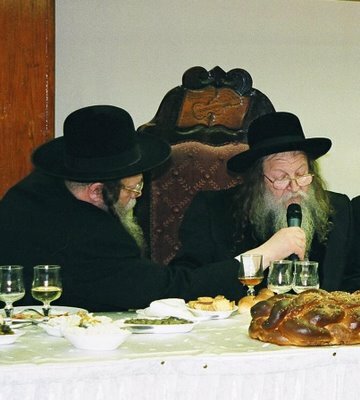 I was fortunate to spend the “Shabbos Yahrzeit” of Parshas Vayetzei with the Rebbe Shlita, which preceded two yahrzeits that week, of the first two Modzitzer Rebbes, as we mentioned. This was followed by my own “Shabbos Yahrzeit,” [preceding my Dad's yahrzeit] wherein I shared the following words of the Rebbe Shlita at a [Carlebach-style] minyan held in my home last Friday night. As Rashi points out in this week’s parsha, Vayeshev, there is a strong connection between Yaakov Avinu and his son, Yosef: “Whatever happened to Yaakov, also happened to Yosef,” and Rashi enumerates several examples. This connection links the parshios from Vayetzei until the end of Sefer Breishis [the Book of Genesis], that is, the portions of Vayetzei, Vayishlach, Vayeshev, Miketz, Vayigash and Vayechi are all connected. At the very end of Parshas Toldos [Breishis 28:9], there is a very long Rashi which proves that Yaakov spent fourteen years learning Torah in Beis Ever [Ever was a great-grandson of Shem, the son of Noach. He passed away in 2187, when Yaakov was already 79 years old and living near his father-in-law Lavan in Charan]. Rashi mentions that Yosef was separated from his father Yaakov for 22 years, corresponding to the 22 years that Yaakov was separated from his father, Yitzchak, and did not honor him. These 22 years were the 20 years Yaakov spent by Lavan and the two years “on the road,” that he took to return to his father’s home. This idea is echoed in our Parsha [37:34], where we are told that Yaakov mourned for his son ‘for many days.’ Rashi says that this refers to 22 years, corresponding to the 22 years that Yaakov did not fulfill the mitzva of Kibud Av v’Em [honoring his parents]. The Gemara [Megilla, 17a] asks that Yaakov was absent from his parents for 36, not 22 years! The answer is that the fourteen years spent learning Torah in Beis Ever is not held against him. As Rashi explains at the end of Toldos, “because of the merit of learning Torah, he wasn’t punished for them [these 14 years], and Yosef was separated from him for only 22 years, midda keneged midda [measure for measure]. The Rebbe Shlita asks, how can this be? How was it that Yaakov was punished for not honoring his parents, when his entire mission of leaving his parents’ home and going to Charan, was at the bidding of his parents, and thus a fulfillment of the mitzva of Kibud Av v’Em? In the same way that the merit of learning Torah protected Yaakov from punishment for those 14 years, the merit of the mitzva of Kibud Av should have protected him for the 20 years in Lavan’s house! The answer lies in Yaakov’s return journey homeward. On the way from Eretz Yisrael to Charan, Yaakov spends 14 years learning Torah, and another 20 years at Lavan’s home [at his parents’ request], working to “pay” for the privilege of marrying Lavan’s daughters. But now that this long spell is over, shouldn’t Yaakov travel post haste back to his father’s home and the Land of Israel? And yet, he takes his time: a year and a half in Sukkos, and another half a year in Beit El. This tarrying indicates a p'gam, a defect in Yaakov’s mitzva of Kibud Av. It also calls into question the whole 20 years that preceded – perhaps they weren’t only out of the pure motivation of honoring his parents. Since there was a defect in that mitzva, it could no longer protect him, and Yaakov was punished for the entire 22-year period. Furthermore, one cannot compare a two-year delay alone, with a two-year delay that follows a period of 20 years. The latter is a lot more painful. So Yaakov’s punishment had to be “midda keneged midda,” and added up to a 22-year period. Finally, the Gemara [Sotah 21a] informs us that the mitzva of learning Torah protects and saves a person, while he is occupied with it, and while he is not. But the performance of other mitzvos protect and save a person only while he is occupied with it. When he is not occupied with it, it cannot save a person [from punishment]. So we can thus understand why Yaakov was punished for the 22 years, but not for the full 36 years of absence, for the 14 years of learning Torah afforded him both protection and hatzala – being saved. From this, we can see the extreme importance of the mitzva of honoring one’s parents, and how careful we need to be with it. Our honoring them does not cease after they leave this world – indeed, the recital of Kaddish, the observance of a Yahrzeit and similar events are ways we can honor our parents long after they have “left” us. May this be a merit for the Neshama of my father, Avraham Tzvi ben Yehuda. Tehi zichro Baruch -- may his memory be for a blessing!